As the series title implies each Clinician's Desk Reference is a practical resource and a daily aid for physicians in the hospital setting and in primary care. Asthma is one of the most important chronic disorders in the developed world. Evidence from around the world shows the prevalence of asthma has increased considerably since 1975, and now affects around 7.2% of the world population (about 100 million individuals). In the UK asthma is now the most common chronic disease affecting all age groups with approximately 11% of the population being diagnosed as having asthma at some time in their lives. Understanding of the basic mechanisms involved in the pathogenesis of asthma has improved dramatically over the past 20 years. Along with this increase in basic scientific knowledge, randomized clinical trials have produced evidence to guide clinicians in how to manage patients with asthma. The book covers epidemiology, diagnosis and management, and takes a look at future developments. 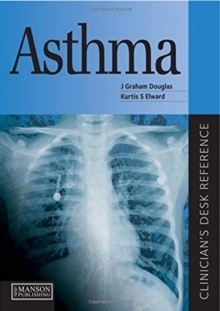 The authors highlight the under diagnosis of occupational asthma and emphasize the importance of effective patient education, particularly asthma action plans. There are ten clinical cases dealing with common diagnostic and management problems, frequently asked questions and appendices containing resources for patients and clinicians including useful websites, information leaflets and major references.